Add to My Favorite Store. 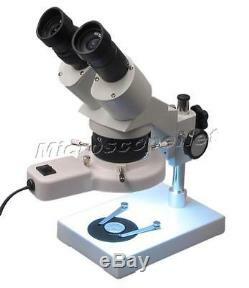 Binocular Stereo Microscope 20X-40X with fluorescent ring light. Super wide field eyepieces WF10X/20. Plug and see, no special knowledge needed. High quality optical glass elements. Long working distance allows enough operation space. Diopter adjustment on ocular tube. Adjustable inter-pupillary distance to fit anyone's eyes. Product GS and CE approved. Objective: rotatable 2X and 4X. Ocular tube diopter adjustment ±5dp. Interpupillary distance: 2-3/16" 2-15/16"(5575mm). Illumination: 8W fluorescent ring light. White/black plastic stage plate: 2-3/8 (60mm) in diameter. Power supply: 110V/60Hz (US and Canada). Dimension: 6-3/4" x 4-1/2" x 11-1/2 (17cm x 11.5cm x 29cm). Net weight: 4lb 7oz (2kg). Package volume equivalent weight: 11lb (5kg). Binocular stereo microscope with 2x and 4x objective. 8W fluorescent ring light with tube. 1 extra ring light tube. 150W Gooseneck fiber cold light - Y type. 150W Cold ring light with fiber pipe. Q: How do I select a microscope that fits my needs? We will collect HST where applicable, or GST if your province does not have HST. Please read this important message: About Communication. A: We are happy to leave feedback for our customers once we have been paid and the item has been delivered to the carrier. We would appreciate that once you receive your item, you also leave us feedback. If you feel that you cannot leave a Positive comment with all 5 stars - WE WILL EARN IT. We are here to exceed your expectations! The item "Student Binocular Stereo Microscope 20X-40X with Fluorescent Ring Light" is in sale since Monday, September 22, 2014. This item is in the category "Toys & Hobbies\Educational\Science & Nature\Microscopes & Chemistry". The seller is "bh542" and is located in Northeast. This item can be shipped to United States, Canada, United Kingdom, China, Mexico, Germany, Japan, Brazil, France, Australia, Russian federation, Denmark, Romania, Slovakia, Bulgaria, Czech republic, Finland, Hungary, Latvia, Lithuania, Malta, Estonia, Greece, Portugal, Cyprus, Slovenia, Sweden, South Korea, Indonesia, Taiwan, South africa, Thailand, Belgium, Hong Kong, Ireland, Netherlands, Poland, Spain, Italy, Austria, Israel, New Zealand, Philippines, Singapore, Switzerland, Norway, Saudi arabia, Ukraine, United arab emirates, Qatar, Kuwait, Bahrain, Croatia, Malaysia, Chile, Colombia, Costa rica, Panama, Trinidad and tobago, Guatemala, Honduras, Jamaica, Antigua and barbuda, Aruba, Belize, Dominica, Grenada, Saint kitts and nevis, Saint lucia, Montserrat, Turks and caicos islands, Barbados, Bangladesh, Bermuda, Brunei darussalam, Bolivia, Ecuador, Egypt, French guiana, Guernsey, Gibraltar, Guadeloupe, Iceland, Jersey, Jordan, Cambodia, Cayman islands, Liechtenstein, Sri lanka, Luxembourg, Monaco, Macao, Martinique, Maldives, Nicaragua, Oman, Peru, Pakistan, Paraguay, Reunion, Dominican republic, El salvador.